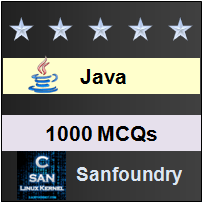 This set of Java Multiple Choice Questions & Answers (MCQs) focuses on “Data Structures-Enums”. 1. What is the order of variables in Enum? Explanation: The compareTo() method is implemented to order the variable in ascending order. 2. Can we create an instance of Enum outside of Enum itself? Explanation: Enum does not have a public constructor. Explanation: ordinal() method provides number to the variables defined in Enum. 4. If we try to add Enum constants to a TreeSet, what sorting order will it use? Explanation: Tree Set will sort the values in the order in which Enum constants are declared. 5. What is the output of below code snippet? Explanation: Enum types cannot extend class. 6. What is the output of below code snippet? Explanation: Enum cannot have any modifiers. They are public, static and final by default. Explanation: The constructor of Enums is called which prints 10. 8. Which method returns the elements of Enum class? Explanation: getEnumConstants() returns the elements of this enum class or null if this Class object does not represent an enum type. 9. Which class does all the Enums extend? Explanation: All enums implicitly extend java.lang.Enum. Since Java does not support multiple inheritance, an enum cannot extend anything else. 10. Are enums are type-safe? Explanation: Enums are type-safe as they have own name-space.